The CEO of America's biggest bank still isn't saying if he's voting for Donald Trump or Hillary Clinton. But Jamie Dimon, the head of JPMorgan Chase (JPM), has a message for both candidates: The U.S. economy should be growing a lot faster. Do what needs to be done to get there. "If the next president focuses on the right things, I think we grow at 4%," Dimon said in an interview Monday with CNBC. That would be double the rate the U.S. has been growing in recent years. The recovery has been especially disappointing this year. Growth so far in 2016 has averaged 1%, but Dimon said he's "not sure" that is accurate. He thinks the economy is stronger than that, especially since Americans continue to buy, buy, buy. So what does the next president need to do to turbocharge growth? Dimon says it's simple: He or she needs to focus on three key agenda items: "proper" immigration reform, "proper" infrastructure spending, and lower taxes on business. 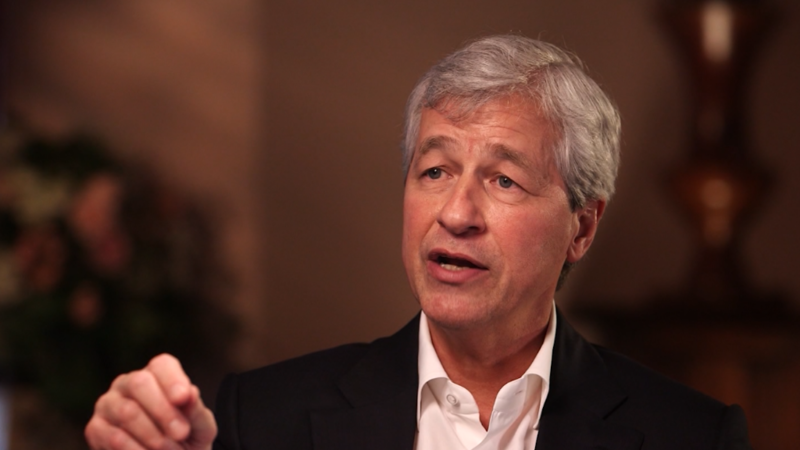 "Three of my grandparents were born overseas," says Dimon, who adds that one of the best branch managers in his entire company is an immigrant who started off as a bank teller. Dimon thinks America needs a "pathway to citizenship" for illegal immigrants and ways to retain more foreign students who graduate from top U.S. universities. He also favors tough security at the borders. There are "lots of ways to make this country boom," Dimon said. He's donated to candidates from both parties in the past, although he's historically given more to Democrats. So far, he has not endorsed either candidate. Both Clinton and Trump support a big boost to infrastructure spending to repair America's bridges, roads and internet highways. Economists across the political spectrum agree that could boost growth. On business taxes, Trump has proposed slashing the corporate tax rate to 15%. (Currently the top corporate tax rate is 39.1%). Clinton isn't proposing any big changes to business taxes yet, although she does want to increase capital gains taxes on investments held for less than six years. As for the anti-Wall Street backlash from both Trump and Clinton, Dimon shrugs its off. "I think JPMorgan makes it a better world," he said.